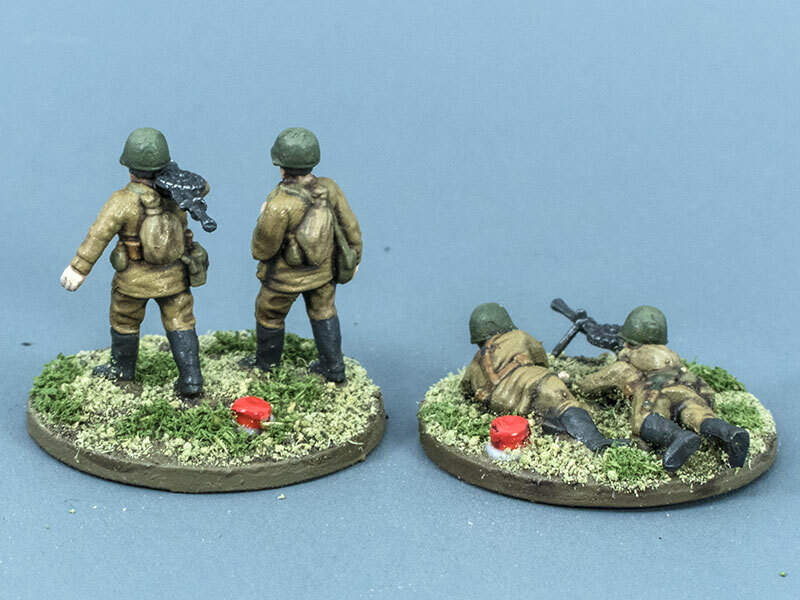 OK, so let's have a closer look at all of the figures off one sprue of the PSC 15mm WWII Russians. 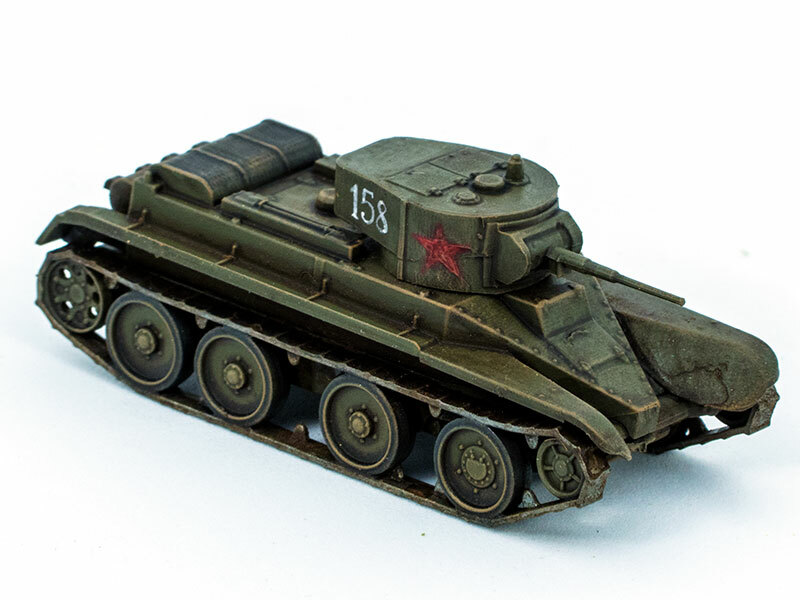 I'm not an expert on the Red Army of WWII by any means, but they look pretty good to me. They're in summer uniform, so no ushanka, and any greatcoats are rolled, not worn. About a third of the troops are armed with a sub-machine gun, the remainder with rifles which look to me like they're meant to be Mosin-Nagants rather than the later SLRs. 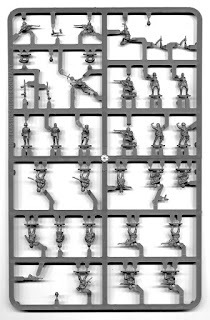 There are two DP LMG groups included on the sprue, three officers (one of whom looks a bit NKVD-ish), and the unarmed female I've mentioned above, for a total of 26 figures. Quite a few of them require some assembly, and being such small figures, the parts can be a bit fiddly to handle, but they go together pretty well. I'd recommend a reasonably quick-setting liquid cement, but probably not superglue unless you want to spend a lot of time peeling your fingertips apart. There are five sprues in the box, so a total of 130 figures for your twenty quid, which isn't too bad. I've read various opinions on what a Soviet rifle company consisted of in 1941-42, but there aren't quite enough figures here for a full-strength company. 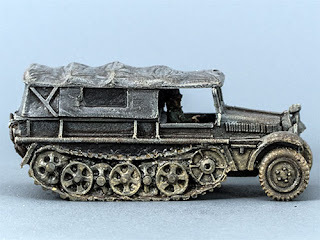 The lack is mostly in support troops like horse-cart drivers, ancillary command group soldiers and the like, so that's not much of an issue for most tabletop wargaming, but there are two too few DP teams for a full company under the stats given in the Battlegroup rules, and if you want the Maxim machine gun platoon you'll have to buy the Support Weapons set (which also includes mortars of various sizes). 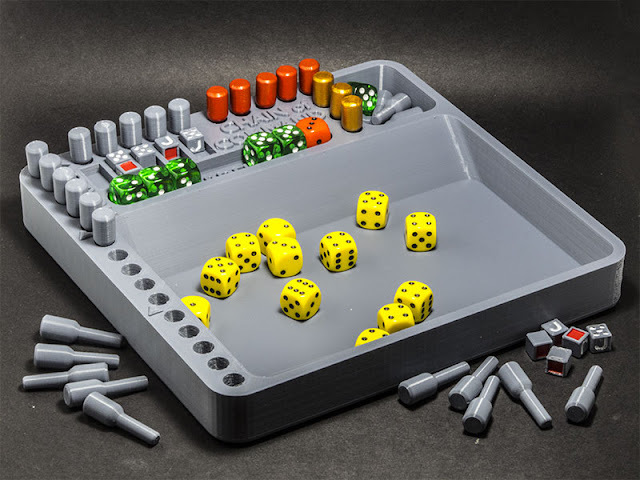 I have a set of those, and no doubt will be presenting them on my blog at a later date. All in all, I'm pretty happy with them. Now, on with painting the rest of the box. 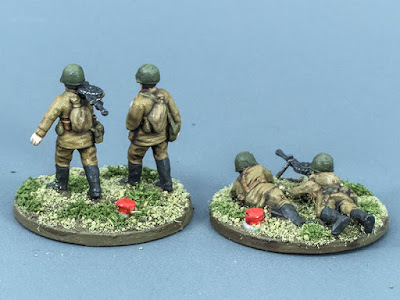 I've finished painting the first of six sprues of PSC 15mm WWII Soviets, and they're just awaiting some flock for their bases. It's going to take quite a bit of painting to finish the lot, especially for someone like me who frankly loathes production-line painting. 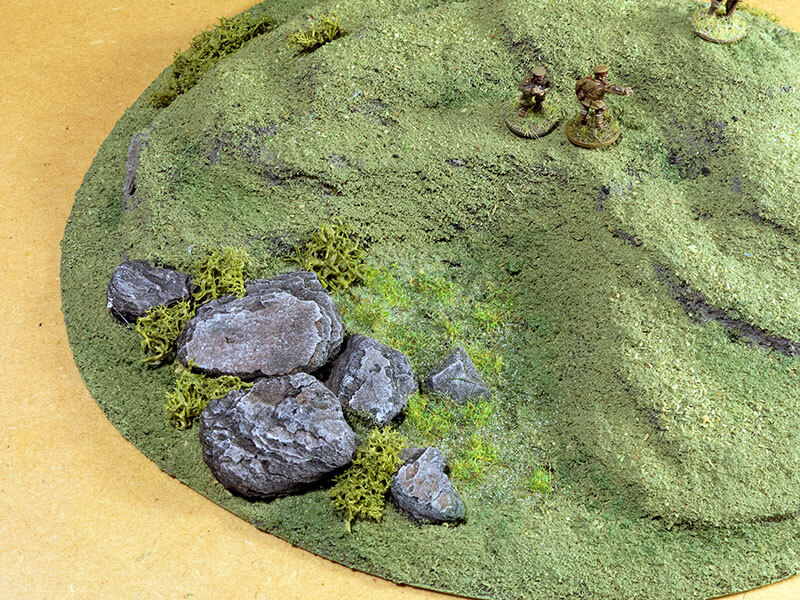 The contents of the box is only five sprues, on each of which are 26 figures (130 in total). 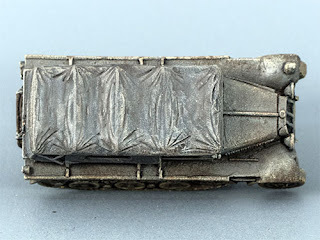 Regrettably, there are only two DP LMG figures on each sprue, and a full strength infantry company requires twelve — three platoons of four sections each, each section with one DP. Fortunately, my friend Steve had a spare sprue which he gave me, so I now have enough machine-guns for a full-strength company. 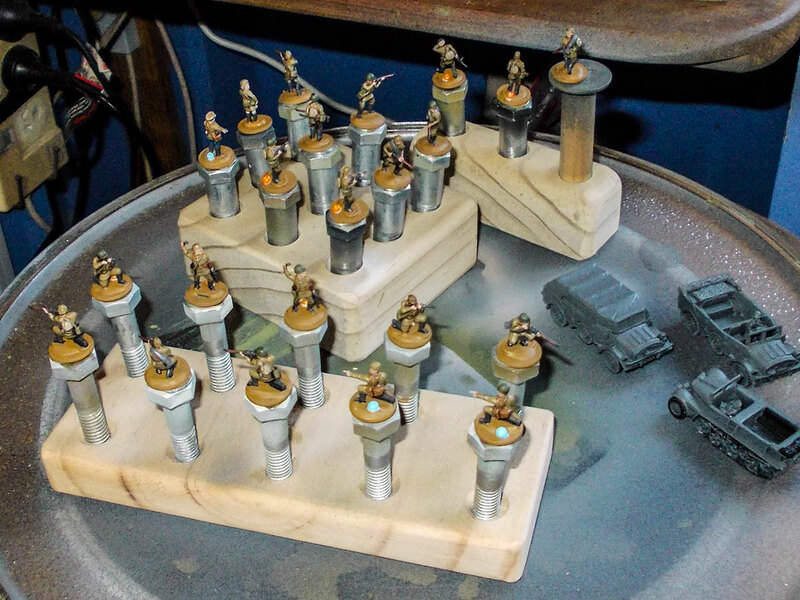 About eight of the figures on each sprue are armed with SMG. I don't really know what the ratio was of SMG to rifle at the beginning of the war (Operation Barbarossa), but it seems a little high to me for my period. Still, it doesn't matter that much since I can just treat them as if they're rifle troops if need be. Among the figures on the sprue is this female soldier. 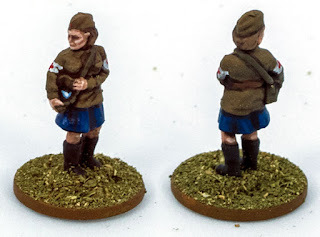 She's unarmed, so I've painted her as a medic — I've taken some artistic licence to include the Red Cross armbands, since she wouldn't have worn them; there'd just be a small red cross on her medic's satchel. However, I wanted to make it quite obvious what she is. The blue dress was, I think, part of the walking-out uniform. Out in the field, she'd be more likely to be wearing trousers like everyone else. 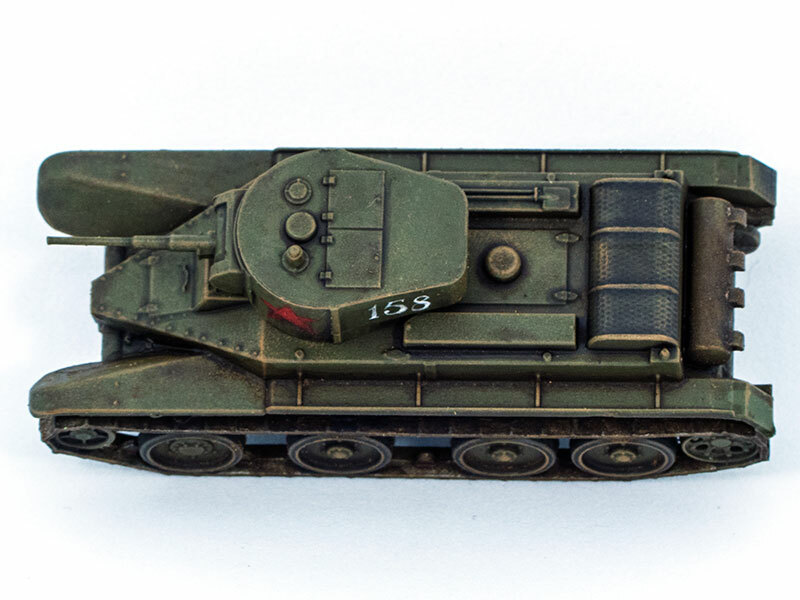 This is another one of Zvezda's cheap snap-together kits, this time of the Soviet BT-5 Fast Tank. 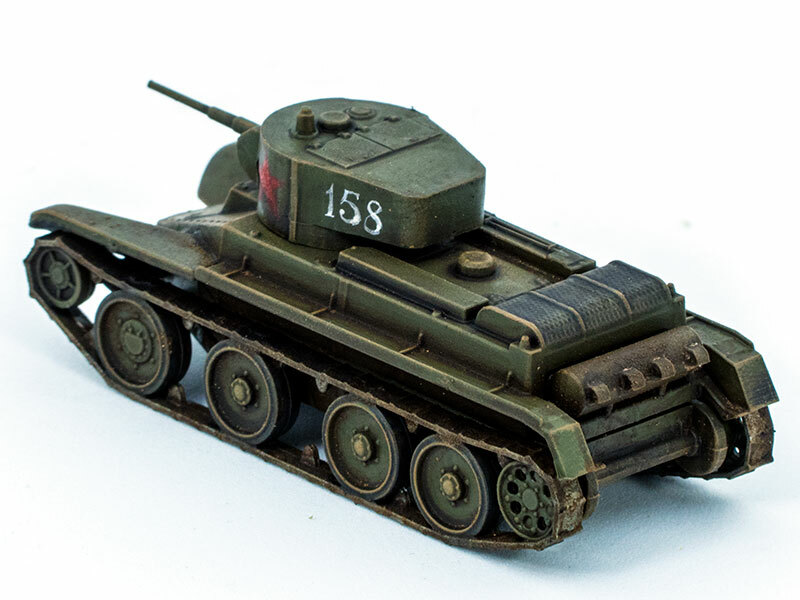 They produced a lot of these, alongside the BT-2 and BT-7, until about the end of 1941, when production was ceased in favour of the T-34. At present I only have this one, but I'll no doubt be getting more as and when I can. I really do like these little Zvezda kits, but this one suffers from having a very prominent mould seam around the turret. I've cleaned it up as much as I could, but it's bad enough that it really needs more significant putty attention. 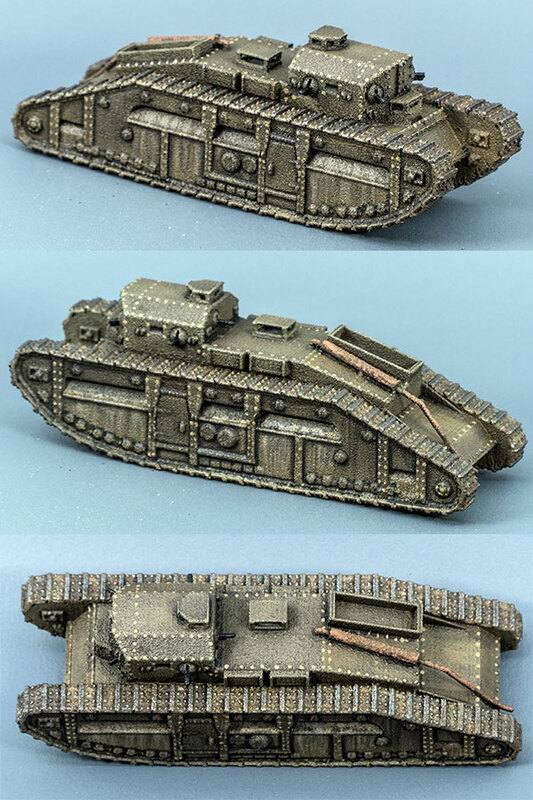 This is my 3d-printed 15mm (1:100 scale) model of the Medium C Hornet of 1919. 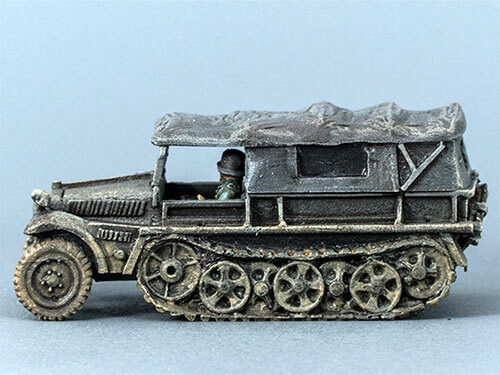 It was a WW1 design, but didn't make it into service before the Armistice on November 11, 1918. It was intended as the replacement for the Medium A Whippet, a difficult and extremely uncomfortable vehicle to drive, with many flaws. I recently bought a couple of packs of 15mm WWII Soviet Infantry from PSC. 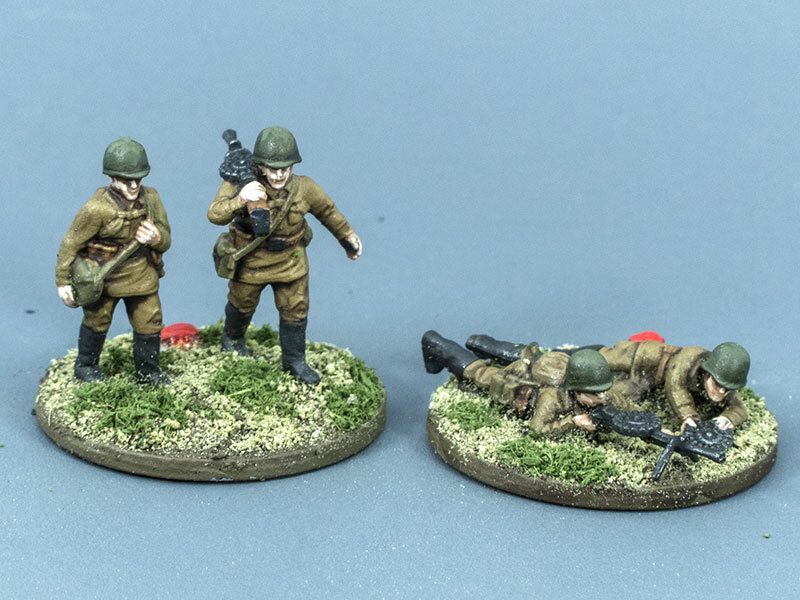 These are the first Soviets I've painted since some Airfix figures I had when I was a kid. They're a couple of LMG teams, and I'm using them as testers to determine which paints and basing materials to use for all the rest, of which there are a couple of hundred. I'm happy enough with the way these look to be confident in painting more. 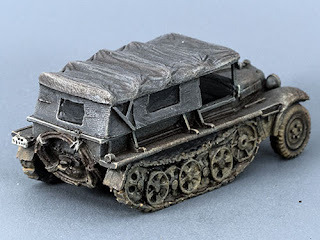 To be honest, I've never been all that keen on wargaming the Soviets, but my interest has been piqued lately by reading Antony Beevor's Stalingrad, and by the range of 1:100 WWII Soviet vehicles available quite cheaply from Zvezda. 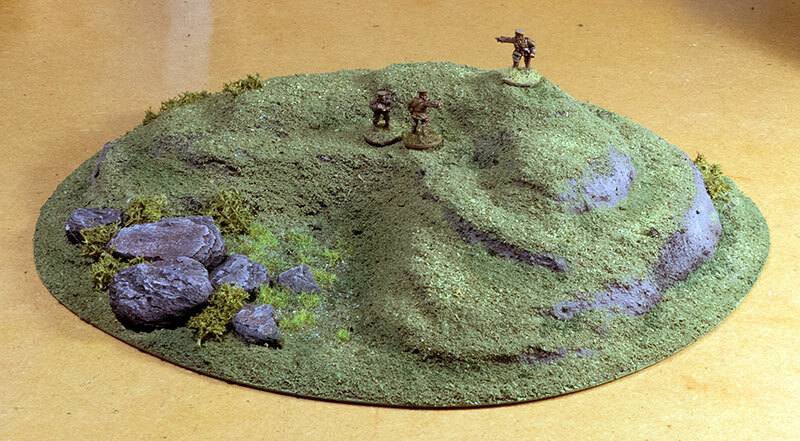 The red bead, incidentally, is there to tell my decrepit old eyes, at tabletop distances, that these are LMG bases. I got a cheap 30-watt foam-cutting hot wand from China a few days ago, and tried it out by carving up a foam off-cut into another hill. The metal wand — the bit that heats up — is about 200mm long, and is somewhat flexible. It works OK, though it doesn't really get quite hot enough to cut easily through the insulation foam I use. I haven't tried it out on expanded polystyrene foam, which it's probably intended for — that stuff is even more temperature-sensitive. 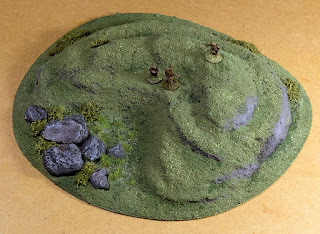 It was a lot easier and less messy to sculpt the 50mm foam sheet into a layered hill suitable for little army men to stand about on than it was to do the same thing with a knife. The stuff I use is designed not to poison everybody in the vicinity in the event of a fire, so the fumes aren't much of a problem. It's not a precision tool though. I wouldn't want to try using it to cut up foam into regular geometric shapes, but for semi-random hack-and-slash work it's fine. I tried out using 5-minute epoxy mixed with acetone as water-effects resin to create a boggy area at the base of the hill, in behind some boulders and bushes. It wasn't particularly successful, but I think I know how to improve the end result another time, and I'll give it another go. The boulders are pieces of pine bark that I nicked from a local playground some years ago. The bark is quite a dark brown in its natural state; I've just given them a couple of layers of dry-brushing to finish them off. 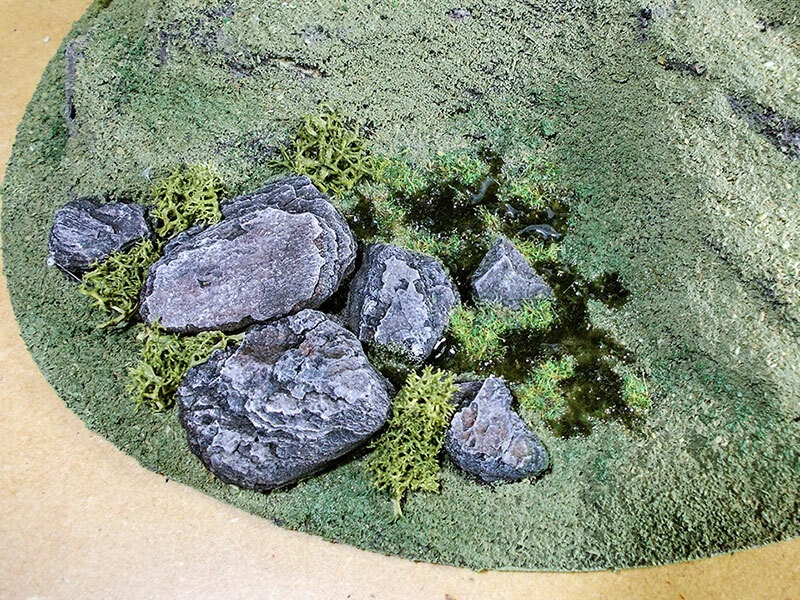 I like using it for rocks; the texture is reasonably convincing, and it's much lighter than actual rocks. I've re-done the water in the boggy patch, and it's a considerable improvement over my first attempt. This time, in addition to the 5-minute epoxy, I used a tiny drop of sepia ink to colour the "water" and a lot less acetone that before. Being more viscous than the first lot, I had to tease each blob out around its perimeter to blend it into the surrounding groundwork. It does create something more of a meniscus than with the very liquid first mix, but it's more controllable overall and creates deeper pools, which gives me some nice tonal variations. 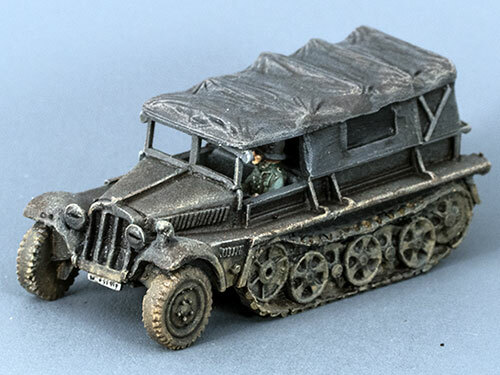 This, and a Horch heavy car, are the first 15mm models I've bought from Skytrex (I think). This one is the little SdKfz 10 half track, which will go into service pulling around my PaK 36 anti-tank guns. Unlike most other 15mm vehicle models these days, these ones are cast entirely from white metal, so they're heavy little things for their size. I haven't done any measuring, but they look OK in size and silhouette, certainly good enough for wargaming purposes, though they do have a somewhat cartoonish look about them. One thing I do regret is the driver figure: he'd be better suited to a right-hand drive vehicle, as he's looking towards his right. That means that his face isn't really easily visible, which is a pity.